Before arriving in Boca de Chila Nayarit, your eyes will be drawn to the postcard-worthy Mexican countryside: watermelon and mango fields, strategically placed metal structures on which the enormous tobacco leaves are hung to dry, and tractors crisscrossing the fields in preparation for the next growing season. Above these wide expanses near Boca de Chila Nayarit you will see white herons and other exotic birds soaring the skies. Beyond the watermelon and mango fields lies a beautiful Pacific coast beaches with warm deep blue waves. Here, you can take in breathtaking sunsets unlike any you could ever imagine! 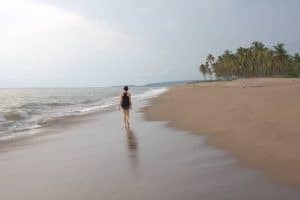 The tropical climate and warm Pacific Ocean waters are some of the most popular attractions of Boca de Chila Nayarit, which is set to be another one of the many great vacation destinations in Riviera Nayarit Mexico. Boca de Chila Nayarit welcomes visitors with its 7.5-kilometer (4.7-mile) white sand beach and abundant vegetation. These will soon provide the perfect backdrop for a tourism development offering visitors elegant Nayarit hotels, professional golf courses, restaurants and everything they might want for a spa and wellness vacation. Near Boca de Chila, which is frequented by lovers of the sea, petroglyphs have been discovered. Many of the ancient petroglyphs are currently on display in the town of Zacoalpan, located eight kilometers (five miles) from Boca de Chila Nayarit. This is a region filled with mangrove swamps and populated by a variety of aquatic and sub-aquatic birds. This destination offers plenty of activities and attractions providing true adventurers with the opportunity to live an exciting experience and observe wildlife and regional flora and fauna up close. And while this ambitious tourist project is now underway, you can find lodging in nearby Punta de Mita, Guayabitos or Chacala. All are located just a few kilometers from Boca de Chila Nayarit where you will also find all the amenities you need for an unforgettable Mexico vacation.